Beginning to produce a podcast can be a little intimidating. Which software do I use to record? How do I choose a mic? Should I use GarageBand, Audacity, or another program for editing? Those questions, and many more, are answered in Take Control of Podcasting On The Mac. I’m always looking for ways to make the podcast sound better and verify that I’m using quality equipment and programs. Take Control of Podcasting On The Mac (TCoP) explains how to “plan, record, edit, and publish a podcast.” Author Andy Affleck confirms my choices in microphone, and recording/editing software, but went even deeper in explaining how they are used and why someone would pick one over another. Choosing a microphone can be a very personal yet daunting experience. To make it a little easier to decide, Affleck created sound samples of him speaking into various mics using different sound settings and devices. Such a simple and clever idea, yet very useful, especially for those of us who have never, or infrequently, used a microphone. Click the links in the book and you’ll be brought to Affleck’s web site to hear the samples. Another nice touch in TCoP is the podcaster profiles. Four long-time podcasters share their tools and hardware used, plus a bit about their podcasts. I found these profiles interesting, yet lacking. I wish there were either more profiles or more depth to the four profiles. Reading about real life situations is not only interesting, but quite useful for those of us wanting to gather as much information as possible to create our podcasting set ups. One area in which new podcasters struggle is creating an RSS feed for their podcast then submitting it to iTunes for publication. Struggle no more! Affleck gives readers step by step instructions on how to generate an RSS feed using FeedBurner, then using that information to publish your podcast on iTunes. When you read about any type of recording, a lot of strange terms are thrown around, including: gain, levels, mixers, compressor. Kinda scary when you have absolutely no idea what they mean or how they might apply to you and your recording. Reading a brief description about these effects in TCoP under the Audio Hijack Pro section was immensely helpful, and made me feel more comfortable when I record my podcast. As a podcaster himself, Affleck shares his home and mobile setups, complete with photos, and why he chose the equipment he uses. Links are included where appropriate. It’s a nice peek into the recording life of the author. 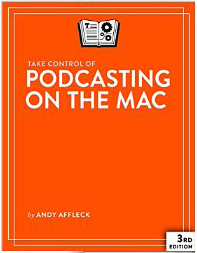 Andy Affleck uses simple language in Take Control of Podcasting On The Mac that doesn’t go over the head of the reader who’s unfamiliar with the subject, yet is still relevant to the more experienced reader. If you’re currently podcasting and happy with your set up and process, this book may not be for you. If, however, you’re new to podcasting or are thinking about starting one, or you’d just like a handy reference, Take Control of Podcasting On The Mac is a very helpful resource.